The season of golden light is here properly now, and I'm trying to remember to find a patch of the syrupy sun to sit in each day while it lasts. How is it where you are? I hope you've had a good week. On the weekend my sister Tamsin and niece came to stay with us. It was a cold weekend and we filled in the days mooching around town, drinking coffee, sitting around the fire knitting, cooking and baking. T makes excellent muesli, and she made a big batch for our pantry and it's delicious. We also went for a walk where she picked an autumnal bouquet of leaves, berries and seed-heads. A dried-out leftover of summer. I finished a project that had been on the needles for a while: a pair of socks for me. I started these on the plane on the way home from Japan. I had brought some some balls of leftover sock yarn for just this purpose, knowing it would take my mind off the long flight. As it happened I only knit about a quarter of one sock, despite the hours on the plane. But they've been good company in the evenings since. I love using up odds and ends to make something new! For these I used scraps from socks I've knitted over the past few years. The pattern is a free one you can find online: Wise Hilda's Basic Ribbed Socks. I use this pattern nearly every time - it always fits perfectly and is easy to customise if you feel inspired to do so. Sometimes I use a different heel or stitch pattern than that given, and for this pair, did a bit of 1x1 ribbing at the top of each sock. You can find more details about this project here on Ravelry. Also pictured: the book I'm reading right now, Blue Self-Portrait, by Noémi Lefebvre, which is translated from the original French and about music, specifically, the work of composer Arnold Schoenberg and is clever and interesting. And also in music news: the highlight of my week was buying a gift for myself: PJ Harvey's album Let England Shake on vinyl. I'm afraid of playing it too often, and being banned by my family to put it on the turntable so will save it for whenever they go out. I do love this album deeply, and it feels timely right now: (autumn, Brexit, Anzac Day, Cyclone Idai, climate change, everything...) This one is my favourite song from it. In April I get inspired to do things like bottling and baking, and cast on knitted hats. The first of these came off the needles while we were travelling in Japan. I amused myself on the plane by knitting on a grey Roku hat for Arlo, albeit slightly clumsily due to the wooden double-pointed needles (I'm usually more of a magic loop knitter). I do love the Roku pattern - it has a nice crown decrease and works up quickly in aran-weight yarn. You can find a link to the pattern and other details here on my Ravelry page. Marmalade is one of my favourite foods (or at least, toast-spreads) and last week I found myself with a bowl of ageing oranges, bought from the Newtown market the week before with delusions of establishing an orange-for-breakfast habit. That didn't happen. But I can still have them each morning, just on my toast instead. To make this marmalade, I used a formula much like this one, except I didn't mash the fruit after cooking. There's something comforting about a late-night marmalade session, especially when you see the jars of gleaming jam on the windowsill the next morning. The other thing about April in the kitchen is the tradition of making Anzac biscuits. You can read a bit about the history of them here. The combination of oats, coconut and golden syrup has always been synonymous with autumn for me, but they are also just a useful thing to keep in the cake tin to have with a cup of tea or pop in the kids' school lunchboxes. Lately I've been making Anzac bars instead of the traditional cookies. You can see them in the first photo above. The mixture is basically the same, but it's a bit quicker and simpler to make, because you just press it into a shallow tin to bake for 10 minutes or so. Here is my recipe. You can add in other things if you like, such as sunflower seeds or dried fruit - anything you have, really. I like to throw in a handful of pumpkin seeds and some currants because they always seem to be waiting there in the cupboard. until combined and starting to simmer. Then stir in 1/2 teaspoon of baking soda. The mixture will froth (and smell delicious). Add this mixture to the dry ingredients and mix well. Bake in a shallow slice tin lined with baking paper for around 15 minutes or until golden. Let the slice cool completely (it will become more firm after half an hour or so) before removing from the tin and cutting into bars. I wanted to share some of my textile-hunting adventures in Japan, which were probably more wide-ranging than these photos suggest. I found that sometimes I got so excited by what I was doing and seeing on my travels that I forgot to document with my camera! But that doesn't matter at all, really. I've admired the work of Naomi Ito (Nani Iro) ever since coming across it online perhaps twelve years ago now. It wasn't until i was in Osaka, and wearing one of my tops made from her fabric, that I realised I might seek out her studio. Travel is so much easier now we have Google Maps and all manner of online resources, and I even found these detailed directions to help me. In the end I went a different way, but was thrilled to find her studio on my own without too many problems. It's a special place because not only are the most recent Nani Iro fabrics on display and for sale, but you can also find lots of fabrics from past seasons for sale, both by the metre and in pre-cut pieces. I bought a few pieces (you can see my purchases in the second photo above) that I absolutely adore, and of course I rather wish I'd bought more, now. But I was trying not to be too acquisitive and I knew I'd have to carry them around in my small suitcase for the rest of the trip! 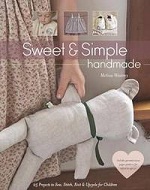 I also bought a special book with sewing patterns for a range of clothes using Nani Iro fabric. The women at the shop were very kind and gave me another book, with poems written by Naomi and accompanying photographs that inspired the most recent textile collection. I paint to spin a tale that portrays a kind of comfort, that makes people happy when they feel it on their skin. I paint in the hope that each textile will be like a single poem, a single letter. You can buy Nani Iro fabrics online, and read a rare interview with Naomi Ito here. As well as some exhibitions, galleries with handmade items, a flea market and other stores, I also visited WALNUT, a sweet little knitting shop in Tokyo. There's also a store in Kyoto, but it was closed when we were there. It reminded me a lot of our own local beauty Holland Road Yarns, with many of the same products for sale. WALNUT is where the magazine Amirisu is produced and they also produce their own hand-dyed yarn which is called Parade. I had to buy two skeins in that glorious dusky pink shade, which I entirely blame on the blossom season outside the window. Japan is well known for its craft and dressmaking fabrics. I managed to visit one fabric store while I was in Osaka: Toraya, in Shinsaibashi. There are several floors of sample fabrics on display, and if you want to buy something you tell an attendant who takes your order. After a ten minute wait, you can collect your order at the counter. So much better than lugging around giant rolls of fabric, like we do here! At Toraya I ordered a few pieces of cotton and linen (my plan for these is knitting project bags for my etsy shop... hopefully soon! ), and also bought a length of chirimen fabric (you can see that above, alongside the yarn). I wanted to get something authentically Japanese. Chirimen is a silky crepe fabric with a lot of drape, often used to make kimono and furoshiki wrapping. With this I hope to make a simple top or jacket for work. I feel so lucky to have been able to explore this beautiful country, even if just for a couple of weeks. I'm dreaming of going back for a longer trip one day. In the meantime, I have plenty of making and remembering to do. So much has happened over the past month. I haven't felt like writing here, or on my other social media accounts, much since the devastating terrorist attack that took place in Christchurch. But at the same time reading articles, blogs and social media posts online have been comforting and illuminating to me in the past few weeks. It's just that I haven't found my own words to add. And I still haven't, really. In the last photo above you can see a sign someone left on a concrete wall on our street. It's a simple statement but it does sum things up. I hope it won't be painted over anytime soon. At the beginning of March, we left Wellington for Japan. It was a trip we had been dreaming of, as a family, for a long time. While our house rather needs painting and many other things should have taken 'priority' we just decided to go for it while we could. I feel so incredibly privileged to have had the opportunity to do this. We had a fabulous time - both as a break from work and just soaking up a different place with all its difference and energy and beauty. I felt that we had stepped into a kind and calm place that was also very busy and important. I wish I had written a diary while we were there to help me remember all the details. I will have to see if Keira will let me read hers from time to time, as she carefully documented her days and annotated her journal pages with receipts and museum tickets, sweet wrappers and labels. - one slice of the view from Tokyo's famous SkyTree tower. - I took photos of the drain covers in each place we visited. This is the beautiful design on drains in Nara. - Keira turned 14 while we were in Japan. Her wish was to visit the Tove Jansson Akebono Children's Forest Park in Saitama, so we did. This was one of the little buildings in the park. There was also a beautiful mud-brick house with a spiral wooden staircase and a reading room where you could sit and explore Tove Jansson's books. There will soon be a new Moomin park built nearby, but we missed the opening by a few days. - we burned some incense alongside people from all over the world at this special communal shrine at Sensoji Temple in Asakusa. - plum and cherry blossoms were starting to come out in the last few days we were in Japan, like party decorations. They're so pretty. Like nearly everyone else, I took a hundred photos of them. I was lucky enough to bring a few craft-related purchases home with me. I'll show these in my next post, coming soon! I hope you are well and happy, dear reader. A weekend away with friends to learn, play and experiment with making. That's on offer at the inaugural Craft Camp, a weekend-long retreat near Wellington organised by Tash and her team at Holland Road Yarn Company , July 12-14. While Tash says this event is aimed at knitters and makers, there are no knitting classes. Each session is designed to complement your existing skills, either to help you celebrate what you already know or add a new talent to your tool belt. The classes on offer feature weaving, photography, mindfulness and more. I'm thrilled to be attending and teaching wool embroidery. In my class, we'll use fine wool yarn to embroider onto linen. Suitable for both beginners and more experienced stitchers, embroidering with yarn is fun and much faster than thread. It's also a great way to use up leftovers from your knitting stash. I'll be sure to bring lots of materials, samples and templates for us to use. Tickets to Craft Camp go on sale on Monday March 11. I'd love to see you there if you can make it! My sister gave birth to her second daughter last week. Such an exciting time! I made some things for my new niece, including the knitted things you can see above. Baby was a little bigger than we were expecting so hopefully she will get some wear out of them! And if not I will happily knit her some more. The booties are a great design - the pattern is called 'Hodge' and you can find it free here. The cuff on each shoe folds over and is ribbed underneath for a snug fit. The little socks were made using this pattern and some leftover sock yarn, and the hat was knit from angora yarn and the pattern made up as I went. I can't wait to meet my little niece, H.S.N. Late summer is a good time to harvest flowers although it's been a bit dry here this summer. I did find a few things to put in the flower press though, and when I opened it up, I found a batch of last summer's blooms. I used these to make up some little tags to attach to presents and etsy orders, etc. To make these, I place the flowers on scrap bits of card and then add a layer of clear plastic seal. Then I cut around the flowers and punch a hole in the top for fastening. Inspired by the pressed flowers, I also embroidered some botanical pins. I really enjoy making these, and the way they provide the chance to use up the tiniest scraps of linen, thread and felt. The middle photos above were taken from the deck of the inter-island ferry on the weekend, and walking down a fern-lined path upon our arrival in the South Island. Tom and I were lucky enough to attend our friends' wedding on the lawn in front of a beach house by the sea in the Marlborough Sounds. I hope you have had a lovely weekend, dear reader! We are going away on a family adventure for a couple of weeks. I'll be back in late March, so see you then. It's blackberry season, which means summer won't be staying for much longer. There are blackberry vines that grow along the side of our road by the bus stop and I've been watching the berries ripen every afternoon on my walk up the hill. No-one seemed interested in harvesting them. But the other day I 'helped' Tom by holding the ladder steady while he climbed up and picked enough for a pie. It was delicious, as once-a-year type of food always is. Another special thing this week was the arrival of a skein of yarn from Lindsay of A Wooden Nest. Lindsay creates beautiful natural-dyed yarns and I've been admiring her work for a while. If you like podcasts, she has one here you can follow. I happened to be perusing Instagram when I saw she had put some yarn in her shop, so I popped over and managed to secure what i think was the last skein! It's a gorgeous deep/brownish pink cashmere-merino-nylon sock yarn coloured with cochineal (hence the beetles mentioned in the title of this post). Looking forward to knitting some good winter socks with it. Or maybe something for a new baby in the family. In the other pictures above you can see the panel I made as part of the recent Suffrage in Stitches project. This is a NZ-wide project that celebrates the 125th anniversary of NZ women getting the vote. The panels made by a range of New Zealanders will be exhibited together at Wellington Museum in August. I confess I chose the name Emily Wastney because we shared a surname, but I didn't know anything about her, nor did I realise she had once lived in the house I grew up in. Through the experience of making this panel I've learned a lot about Emily, thanks in particular to our national library and museum's digital resources. It took me a while to realise (and perhaps, accept) I needed to look for her under her husband's name, 'Mrs G Wastney', but once I did, it opened up a world of interesting insights into her life. Born in Nelson as Emily Alborough in 1863, she married into the Wastney family who farmed at North Nelson. In 1915 she helped establish the first 'Daffodil Day' with the aim of raising money to send to NZ soldiers (among them, her son Edward Fox) on the Western Front at Christmas, and was in charge of supplying bulbs for this purpose. She had five children and a special fondness for arum lilies (those she probably planted are still growing abundantly where she lived) and made displays of them for community and church events. She was known for propagating different types of daffodil bulbs and won prizes for these as well as her fruit cake, sweet peas and lemon cheesecake. She also played hockey and tennis. I think she might have been competitive! That's why I included a prize ribbon and bulb on the panel. I've used mostly free-form embroidery for this panel, but also a bit of patchwork to honour Emily's 'make do and mend' skills, crosses for the 46 other women who signed the sheet, and applique for the lilies. I'm grateful to the organisers of this project! I loved making this panel for my ancestor. I finished another knitting project since I last wrote here, a whole shawl even. In truth, much of it was knitted over the end of the summer holiday, just before work and school started up again. It's the Hedgewitch Shawl by Canadian designer Nat Raedwulf and there was a fun knitalong happening over midwinter/midsummer that I was inspired to join after watching an episode of the gentle knitter podcast (highly recommended if you love knitting, by the way). I wanted to use yarn from my stash (aka the box under my bed) and settled on a beautiful grey-mauve yarn that was a gift from my friend Susanna a few years ago: two skeins of Purl Soho flax down that she bought when she was in New York. I'd been waiting to find the perfect project for it, and I found it! It's the most beautiful soft yarn, and it was lovely to knit with. For the shawl's border I used some grey possum/merino, also from the box under the bed. The shawl's design is very simple but it has a feathery textured pattern and the finished item is quite large - I can't wait to wear it when autumn comes around. Tom's joking that we won't need firewood this year. If you follow the designer on Instagram (@wolfandfaunknits) I believe she's having a sale on her patterns for 24 hours or so, so it might be the perfect time to buy this pattern if you like it! More information about my version of Hedgewitch, including the yarns and needle sizes, etc can be found in my Ravelry notes here. And lastly, i wanted to show you this beautiful calendar I was sent by Making magazine. It's a real beauty - with watercolour paintings of a plant or animal that provides fibre for us to craft from, along with a plant that can be used for natural dyeing. When my sister and I were kids, we used to excitedly flip through calendars to see what the picture was on 'our' month (to correspond with our birthdays). In this calendar, October has a painting of a cochineal bug and a hemp plant. Perfect. Hello! I hope you're well, and the end of January is ticking along nicely for you. I can't quite believe that February starts tomorrow. Despite a small 'heatwave' we're having (with apologies to those in extremely cold temperatures elsewhere!) I haven't wanted to put down my knitting needles. I finished knitting the linen pullover I mentioned in my last post - the Nuala top. This is a pattern designed by Libby Jonson (Truly Myrtle) for linen or cotton yarn. I love my new top! It's super comfortable and it was a fun thing to knit. I'm even considering making it again but in a wool yarn for winter. I think it would be a great winter layering garment in black... You can read more about my particular version - details, yarn used, etc, here on my Ravelry page. When it's been truly too hot to think about knitting (a rare thing here in Wellington!) I've been doing a bit of embroidery, and also working on my hand-pieced quilt top that I started last summer. I mostly forgot about this project last year, but once I'd remembered it again I couldn't stop working on it! It's a slow process, but I enjoy it, hexagon by hexagon. I'm using entirely recycled cotton fabrics for this - mostly old clothes but also off-cuts from other projects and some bedding (there are a couple of faded pillowcases and duvet covers I've cut up to use). The goal is to keep going until it is queen bed-sized. Last week I was lucky enough to listen to Nigella Lawson speak at a live show. She was just as intelligent, funny and beautiful as you'd imagine. The experience reminded me that I adored Nigella's first book, How to Eat when I first came across it in my twenties. In fact I still think of a passage in there about marmite and butter sandwiches every morning when I eat my marmite on toast. The event also reminded me that men tend to ask more questions (and give more 'statements') during 'Q and A' sessions. Did you notice the photo above, showing my latest garden addition? I first saw these beautiful native hibiscus flowers, called Puarangi, at Tom's aunt Fini's house over the summer. Her plant was quite large and covered in both blooming puarangi flowers and the papery capsules that encase them before blooming. The flowers are a creamy yellow with maroon centres. Fini kindly gave me seeds to try in my own garden, but then on the weekend I saw larger Puarangi plants for sale at the Paraparaumu community market so I had to buy one. I'll post a photo of the flowers as soon when they feel comfortable enough in our garden to bloom. If you follow members of the craft/making community on Instagram you will know about the important discussions about diversity, inclusiveness and racism in the craft world. It's wonderful to be talking about this! It's overdue. From the bottom of my heart, I thank Instagrammers sukrita, ocean_bythesea, thecolormustard, arohaknits and many others who have been doing a lot of the emotional labour in this discussion. You can click on their links to read their posts and stories, even if you're not an Instagram user. I'm sending strength and love to the BIPOC (Black, Indigenous, People of Colour) members of our community and I hear you and thank you for sharing your stories. This month I've been reading Sister Outsider, essays and speeches by the wonderful Audre Lorde as well as working my way through Me and White Supremacy, a resource by Layla F Saad, which can be downloaded for free or a donation here.